The Hedgehog robot will function regardless of which side lands facing up. Image released Sept. 3, 2015. 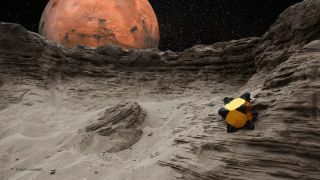 This summer, researchers tested two "hedgehog" robot prototypes, to get an idea of the machines' potential to explore space locations inaccessible to conventional rovers. Wheeled robots like the car-size Mars rover Curiosity work well on planetary surfaces, but in the low-gravity environment of a comet or an asteroid, such machines would be in danger of floating away or snagging on the rough terrain, NASA officials said. That's where the Hedgehog comes in. This spiked cube moves around using spinning and braking internal flywheels. The spikes keep the robot attached to the ground and protect its more delicate body from the terrain. "Hedgehog is a different kind of robot that would hop and tumble on the surface instead of rolling on wheels," Issa Nesnas, Hedgehog team leader at NASA's Jet Propulsion Laboratory (JPL) in Pasadena, California, said in a statement. "It is shaped like a cube and can operate no matter which side it lands on," Nesnas added. "The spikes could also house instruments such as thermal probes to take the temperature of the surface as the robot tumbles." Two Hedgehog prototypes were tested this summer aboard a NASA C-9 aircraft that flies parabolic arcs to generate microgravity conditions for a few seconds at a time. During 180 parabolas over the course of four flights, the robots' handlers tried out several ways of moving them around on various types of terrain. Some of the maneuvers in Hedgehog's repository include "yaw" (a turn in place using the spikes) or a "tornado" (in which the robot can spin aggressively on a spike and launch off the surface). One prototype was created by JPL and the other by Stanford University. The JPL prototype weighs roughly 11 lbs. (5 kilograms), while the Stanford prototype is smaller and lighter, and contains shorter spikes. Also, the two prototypes brake differently: JPL's uses disc brakes, whereas the Stanford robot uses friction belts, NASA officials said. The research is in Phase 2 development under the NASA Innovative Advanced Concepts program, and is led by Marco Pavone, assistant professor of aeronautics and astronautics at Stanford.